SOS Coalition members have been debating the issue of putting forward nominations for the SABC Board. Four members of the Board have resigned. SOS has expressed concern about putting forward new members because the Coalition believes that the current conditions on the Board are not conducive to members playing their critical oversight roles. However, SOS believes that this is an important moment for the communications sector. 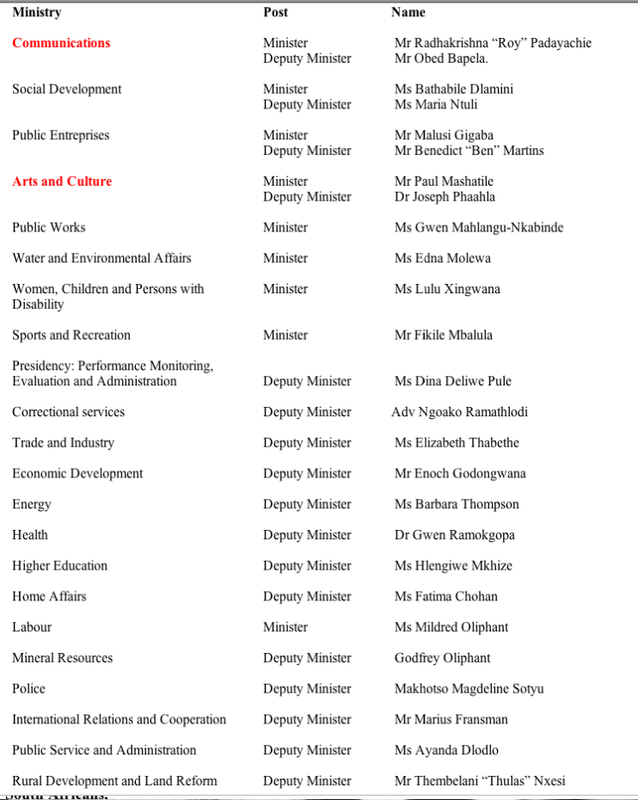 We have a new Minister, Deputy Minister and new Acting Chair of the Portfolio Committee on Communications in place. We believe that with this new leadership in office the possibility of resolving the various crises affecting the SABC is strong. However, in order to ensure that the Minister, Deputy Minister and Acting Chair have time to take action, we urge the Portfolio Committee to extend the nomination deadline to allow time for the necessary changes to be effected. Presently the deadline for nominations is 15 November 2010. The Chair of the Board – SOS believes that the Chair of the Board, Dr. Ben Ngubane should either resign or be removed by the Appointing Body (including Parliament and the President). Dr. Ngubane has been involved in a series of serious corporate governance breaches at the SABC. the Chair’s unilateral decision to announce on SABC TV and Radio that there had been problems with the appointment of an Acting CEO and that he was hoping to reinstate suspended CEO, Solly Mokoetle. Also in terms of the corporate governance breaches, SOS believes that the remaining board members (including the executive members of the Board that are part of SABC management) should publically commit themselves to scrupulous adherence to good corporate governance practices and protocols going forward. Finally, SOS believes that gaps in the Broadcasting Act, 1999 should be swiftly dealt with. Parliament needs to make a commitment to amending the Broadcasting Act, 1999 to state clearly that the Minister has no role to play in the appointment of the executive members of the Board. The appointment of the executive members is solely the responsibility of the Board. SOS pointed out on numerous occasions during the Broadcasting Amendment Bill process in 2008, the fact that the Broadcasting Act is problematically silent about the appointment of executive management. To date Parliament has not resolved this issue creating continuing crises around these appointments. Further, these gaps in the legislation encourage inappropriate Ministerial interference in the direct management and editorial control of the SABC. People must remember that the CEO of the SABC is also the SABC's editor-in-chief. SOS believes that we need substantive progress in terms of the above in order to be able to convince people with integrity to stand for the SABC Board. A further issue we need to consider Is the overall composition of the Board in terms of the issues of skills, experience and representivity. So for instance it is important to analyse the skills that we have lost through the four resignations and thus the skills that we need. Going forward we need to ensure that the SABC Board has the right combination of people to steer the SABC ship to calmer waters. We believe that an unstable SABC is a threat to democracy and socio economic development. It denies the large majority of our population the ability to receive information and to have a voice. Please click on the image above to view the event details. 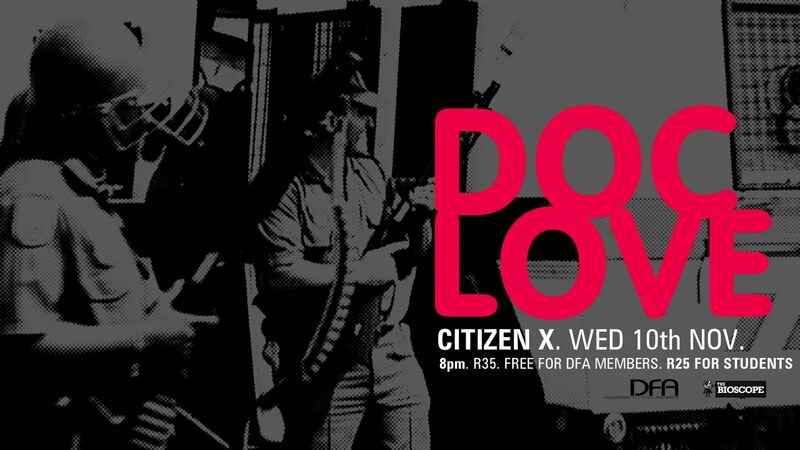 DocLove Nights brings you A special screening of a Capetonian classic, OVERSPRAY. 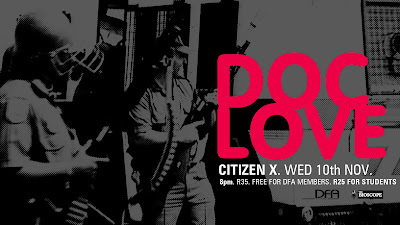 This film was completed nearly ten years ago and is an important cultural snapshot of graffiti and street culture in South Africa. It features a number of artists who are household names today. A must see for anyone interested in street art, grafitti, and "getting up!" 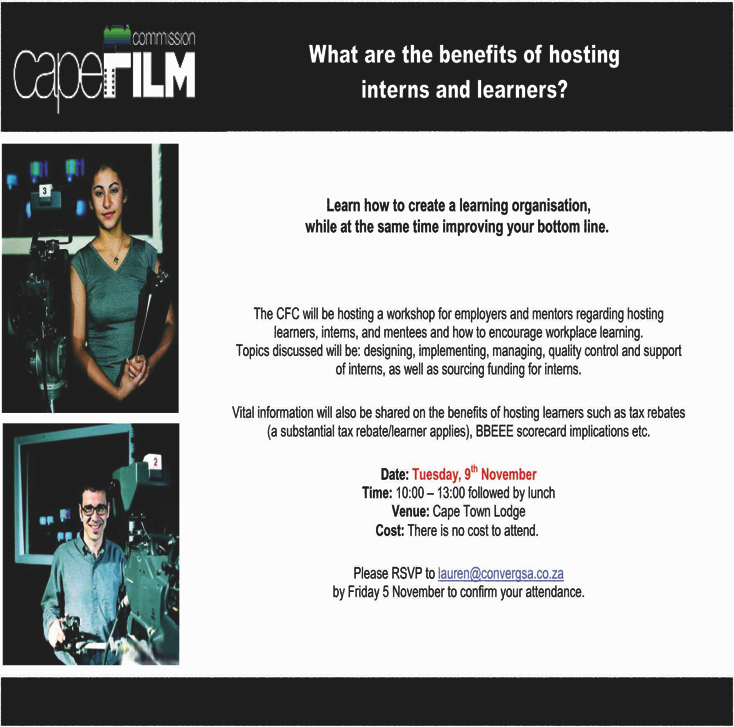 Filmmaker Ebrahim Hajee will be in attendance; and will be showing a preview of an upcoming documentary project. Graffiti artists, Claude and Eeb, record the struggle for dominance between some of the most established graffiti crews in Cape Town. Local legends Falko, Sky 1 and Wealz 130 prepare for the showdown. They are active "writers" - veterans of the scene who make a living through their art. Then there are the more anarchic young writers, off the streets, making names for themselves with illegal "bombing." The film culminates in the "battle": a huge hip-hop event that draws young people from all walks of life. The signs of territorial battles are on every street corner, if only you knew how to read them ... this energetic film will be your interpreter and guide. It looks like the Parliamentary Committee dealing with Secrecy Bill is under considerable pressure to complete its work before they go into recess. Note the following schedualled meetings. At the final meeting the y plan to have "Final Consideration" of the bill. Anyone who can attend any of these meeting should please let me know (mark@amandla.org.za). We will aim to keep an eye on the committee and keep you briefed. See a good update from Today's meeting prepared by Sithembile Mbete below. In the mean time let us continue to educate, mobilize and organize in communities for the Right2Know! Provincial working groups have been meeting to discuss the coordinated way forward after the Week Of Action and reports will be circulated shortly. The Ad Hoc Committee on the Protection of Information Bill met today at 9:00 at Parliament. The purpose of the meeting was to discuss the concerns raised during the public hearings and for each political party to present its recommendations to the committee. Unsurprisingly the ANC’s recommendations were pretty consistent with the proposals made by the Minister to the committee in September and October. Mr Landers spoke on behalf of the ANC. He suggested that “national interest” and “commercial information” (chapter 5) be removed from the bill altogether. The definition of “national security” should then be reviewed and redrafted to apply more narrowly. He further recommended that the penalties for officials who classify information erroneously should be as harsh as the penalties for those who hold or disclose classified information unlawfully. Another suggestion was that the minister should devise mechanisms to help with the review and appeal process and that officials who classify information should not be a part of the review process. Mr Landers also suggested that chapter 4 which discusses the protection of valuable information be removed and that chapter 2 be rewritten so it provides for valuable information. Ms Mentor added to the ANC’s proposals by recommending that Section 38 reference the Protected Disclosures Act in order to protect whistleblowers. Mr Swart from the ACDP recommended the inclusion of a public interest defence/override in the bill. He also asked that provision be made for information that was already in the public domain not to be retroactively classified according to this bill. His final recommendation was for an independent appeals mechanism that would preferably not be an advisory board but rather a single judge. Ms Smuts suggested that the application of the bill be narrowed to only include the intelligence services in the classification of information. This would entail removing clause 3.1 that refers to all organs of state. She argued that other government departments for example, defence and the police service already had their own mechanisms regulating the classification of information so they should not be included in this bill. To further narrow the bill she recommended using the 2008 definition of national security. In order to make the bill consistent with PAIA she suggested that clause 23 (which deals with application for the review of the classification of information) and clause 28 (which allows for the request of classified information under PAIA) be merged. She also recommended that a public interest override be included consistent with clause 46 of PAIA. A further suggestion was that the penalties in clause 38 and clause 43 be made consistent as the bill currently punished receivers of classified information more harshly than the officials disclosing such information. The DA also recommended an independent appeal mechanism. Ms Smuts suggested that it be the same appeal mechanism as is currently being discussed with regards the Protection of Personal Information Bill. Dr Ambrosini disagreed with the DA on the scope of the bill arguing that there was a need for information classification across departments and organs of state. Instead of worrying about the scope of the bill, the committee should rather focus its concern on ensuring the guarantees (e.g. public interest override) were included. He further recommended that commercial information be kept in the bill because such information needed classification as well (he used the example of classifying SARS info about individuals). The majority of the debate was concerned with how the POI bill can be made consistent with PAIA. The parties had differing interpretations of PAIA and whether its provisions were mandatory or discretionary. To illustrate the potential conflict Ms Smuts asked what would happen if information fulfilled the criteria for disclosure under PAIA but was classified under the POI bill? It is already written into PAIA that it overrides other legislation regarding information so how would it interact with the POI bill? All the MPs agreed that the POI bill must be made consistent with PAIA and resolved to familiarise themselves with PAIA before their next meeting. Another aspect of the debate was who should be allowed to classify information. Mr Landers said while he had no problem with the heads of all organs of state being able to classify, he was concerned that this ability could be delegated. He proposed that a clause on delegation be included which would restrict classification ability to the level of Deputy Directors-General or above. The committee agreed to remove chapter 5, the definitions on national interest and commercial information. It was also agreed to make the penalties for incorrect/illegal classification consistent with those for unlawful disclosure. The drafters were tasked with making these changes by Thursday at 2pm. The removal of commercial information may be reviewed by the committee at a later stage. Each party agreed to submit its recommended changes to the committee chair this afternoon so they can be distributed to the other members by tomorrow morning. The next committee meeting is tomorrow, Thursday 4 November at 2pm in room E305 in the National Assembly Building, Parliament. The venue may change if a larger room can be secured. It appears the committee is in quite a rush to make its report to Parliament before recess on the 18 November. Members want to start going through the Bill clause by clause tomorrow. This means we must act quickly if we want to influence committee members as they redraft the bill. Parliament is losing the highly respected chairman of its portfolio committee on communications. 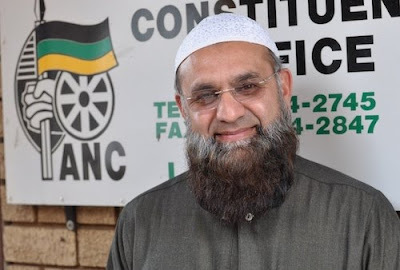 Ismail Vadi has been appointed as the new MEC for roads and transport in Gauteng, meaning he’ll have to give up his parliamentary duties as early as this week. Vadi is on a study tour to Canada and the UK and could not immediately be reached for comment. However, Beverly Walters, executive secretary to the portfolio committee confirmed to TechCentral on Tuesday that Gauteng premier Nomvula Mokonyane had appointed him to the provincial cabinet. His loss to parliament is a big blow for the telecommunications and broadcasting industries. Vadi, who is regarded by many in the industry as incorruptible, was a hard worker, and gave poorly performing state-owned enterprises and even the department of communications a hard time over their performance — or lack thereof. It’s not known yet who will replace Vadi as chairman of the committee but Walters says she hopes a decision will be made by the ANC chief whip in parliament before the end of the week. Vadi, who is an ANC MP, has his constituency in Lenasia, south-west of Johannesburg. He’s been a parliamentarian since 1994 and served 12 years in the education portfolio committee. In more recent years, he’s developed an interest in security and crime issues and has worked in parliament’s safety and security portfolio committee and in the joint standing committee on intelligence. Born in Kliptown, near Soweto, the 49-year-old Vadi has lived in Lenasia for the past 45 years. Vadi, who forms part of the ANC’s leadership in Gauteng, first became involved in politics at Wits where he was a member of the executive committee of the Black Student Society in 1980 and 1981. He later became involved in youth politics in Lenasia as an activist for the ANC-aligned Transvaal Indian Congress and the United Democratic Front. Note - original pagination has been preserved for citations purposes. strike you as false now and wrong perhaps for the tribe? revealing about yourself than my answer would be about me. Locke: I meant them quite sincerely. sincere but also what I believe to be honest (emphasis mine). Locke is centered in the frame. Native: Now, we can have an interview. You can ask me the same questions as before. Questions of voice, authority, and authorship have become a serious concern among documentary filmmakers and anthropologists. Who can represent someone else, with what intention, in what "language," and in what environment is a conundrum that characterizes the postmodern era. In this essay, I explore some of the responses to these problems by focusing on the relationship between documentary/ethnographic filmmakers and the people they film-in particular, the development of cooperative, collaborative and subject-generated films. The social, political and epistemological implications of filmmakers sharing or relinquishing their power is discussed. The construction of the argument presented here is a consequence of my identity as an anthropologist interested in pictorial media as a means of producing culture. I find thinking about visual images as socially constructed communicative forms to be productive and the work of Sol Worth (1981), Larry Gross (1988), Howard Becker (1982), John Berger (1972, 1980), Faye Ginsberg (1989, 1991), and Alan Sekula (1978) useful. the remainder of the essay. The first edition of the Africa International Film Festival will soon be upon us. Travel to port Harcourt, Rivers State, Nigeria in December to meet local and international filmmakers and other industry players. Click on the image or visit the link to learn more about the festival and the film market. Body (including Parliament and the President). corporate governance practices and protocols going forward. interference in the direct management and editorial control of the SABC. The SOS Coalition believes that it cannot in good faith approach members of the public to stand for the SABC Board unless these problems have been decisively resolved. The SABC Board and oversight structures need to start 2011 with a commitment to good corporate governance otherwise the Corporation will continue to lurch from crisis to crisis. Civil society cannot stand by and let our SABC crumble. In a shock development, controversial communications minister Siphiwe Nyanda has lost his job. President Jacob Zuma announced on Sunday evening that Nyanda would be replaced by former deputy communications minister Roy Padayachie. Padayachie, who had served as deputy communications minister under the late Ivy Matsepe-Casaburri, was most recently deputy minister of public service & administration. News of Nyanda's axing came as a surprise to political analysts given that he was seen as politically close to Zuma. The president's decision to remove him from the portfolio comes just months after the spectacular fall-out between Nyanda and his former director-general Mamodupi Mohlala, whom he dismissed. Nyanda has been dogged by controversy ever since taking office as minister, with allegations that he benefited from dodgy tenders. Dina Pule, Nyanda's deputy, has also been replaced. Zuma has named her deputy minister in the presidency where she will be responsible for performance monitoring, evaluation and administration. Former parliamentary house chairman Obed Bapela has been appointed deputy minister of communications. Bapela is well known for his criticism earlier this year of MPs following a report that revealed the majority of parliamentary workers are computer illiterate. Ismail Vadi, the chairman of parliament's portfolio committee on communications, has welcomed the appointment of both Padayachie and Bapela. Ladies and gentlemen of the media, Fellow South Africans, Today marks the beginning of the CAF African Women’s Championship hosted by our country, featuring eight of the best African women’s soccer teams. We congratulate Banyana Banyana on winning their first game in this competition today, in Daveyton where they played against Tanzania. This is a good start and we trust that it signals greater achievements for our team in this tournament. We have spent 17 months in government since the inauguration of the President of the Republic and the appointment of the National Executive. We have completed the process of the reconfiguration of government, and that of putting in place systems that will help us change the way government works in order to improve service delivery. During this period, we also had time to study the functioning of the current administration in order to ascertain what works and what needs to be changed or strengthened. We are guided by the mission of our government, which is to improve the quality of life of all South Africans especially the poor, working with all our people. Access to basic services is still as important as it was when we attained our freedom in 1994. Given the fact that we still face serious challenges of unemployment, poverty and inequality in the country, government has to work at a faster pace to change the lives of the poor. Our people need to see a visible improvement in the delivery of water, electricity, health care, education, social security, civic services, safety and security and a host of other basic needs. We have the resources, including skilled and experienced senior staff, who have to ensure that these services reach our people, under the leadership of their Ministers and Deputy Ministers. We reiterate that we need a national executive and public service that knows where our people live, who fully understand the needs of our people and what we are trying to achieve. We have taken a long and hard look at some of the departments with a view to strengthening some Ministries. We have noted that a few of them require the addition of Deputy Ministries to assist Ministers in carrying out their responsibilities. Education is a top priority of this government. We have seen it prudent to strengthen the skills and human resource development sector by appointing a Deputy Minister to assist the Minister of Higher Education and Training, given the size of the portfolio. The Performance Monitoring, Evaluation and Administration Ministry also has an expansive mandate which includes performance monitoring and evaluation, youth development, government communications and marketing as well as general administration in the Presidency. A Deputy Minister is being appointed to assist the Minister to manage this over-arching portfolio. We have mentioned before the intention to electrify at least one hundred and fifty homes each year in the country. As of 31 March 2010, the total number of households still awaiting electricity, including informal settlements, was estimated at more than three million. In addition, we have to ensure security of supply in our oil and gas sector. 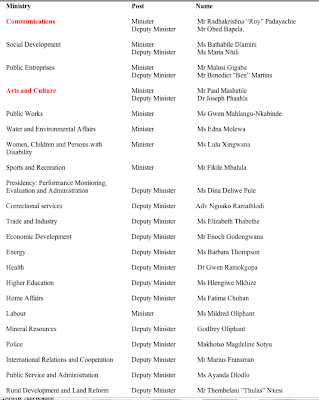 This busy and strategic Ministry will also now have a Deputy Minister. The mining industry has been the foundation of economic development in South Africa for well over a century. In 2009, the mining industry contributed more than thirty percent to the country’s total export revenue, and employed two point nine percent of the country’s economically active population. The Mineral Resources Ministry will be expanded with the addition of a Deputy Ministry to enable it to take forward its responsibilities. We extend our gratitude to the outgoing members of Cabinet for their contribution to government and the country. Some have served in government for many years and we trust that they will still put their expertise at the disposal of the country. Some of the outgoing members are to be deployed in other tasks in government. We congratulate the incoming members of Cabinet as well as the Deputy Ministers and wish them well in their new responsibilities. The new team will be sworn into office tomorrow at 2pm. I thank you.